Dan Galbraith is a Nashville-based arranger, orchestrator, engraver, keyboardist, and trombonist. 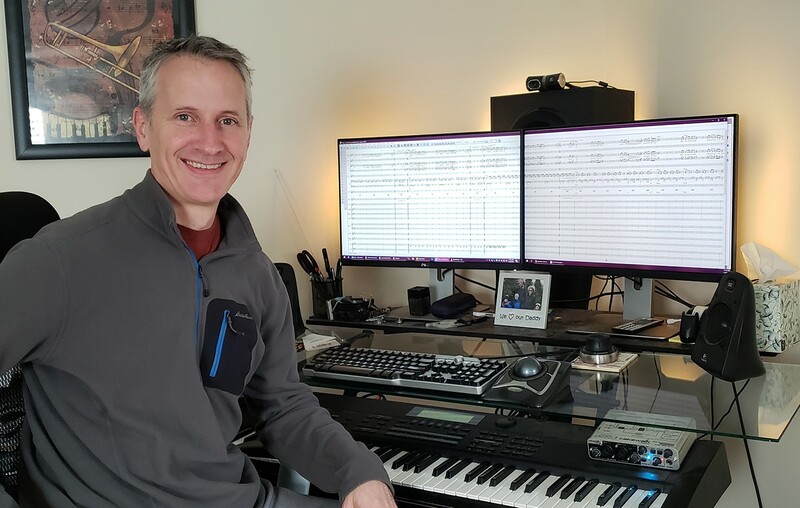 In addition to directing church orchestras, worship teams, and praise bands, he is an arranger/editor/producer at PraiseCharts.com, the online resource for praise leaders around the world. What were your earliest musical experiences? I’ve been playing piano since five years old, always playing for church services and choir as much as I could. I followed the band/orchestra track on trombone through high school and college, and then started church and studio gigs in Oklahoma City for several years. Some of my favorite experiences were playing alongside some outstanding musicians at Metrochurch in Edmond, OK, which is kind of the inspiration for what I do right now with PraiseCharts. When did you first suspect this might be what you’ll do as your career? It wasn’t until I was a senior in high school that I felt a strong prompting from the Lord to pursue music. Being a bit of a math/science nerd up until that point, I assumed that’s where my career would be. Jan Kagarice, my high school trombone teacher, recruited me to the University of North Texas, then after a year, God led me to transfer to Southern Nazarene University to major in piano. Both experiences were influential on me for different reasons. The competition and high-level performance experiences that UNT brought really drove me to pursue excellence, and the smaller, individual-centric environment of SNU allowed for more diverse musical experiences, as well as more personal relationships with the professors. Who were big influences, early on? I draw from a wide variety of styles and personalities – pop, classical, sacred, movie scores, jazz, etc. Some of my favorites include Danny Elfman, John Williams, Nelson Riddle, John Rutter, Robert Sterling, David Hamilton, and James Pankow, of course. What was your first introduction to music notation software? Back in high school (in the mid-80’s) I hired a Dallas-based copyist to engrave a few things for me, back before I had a computer of my own. I can’t remember what software he used. It wasn’t until I graduated from college that I bought a WYSIWYG Windows computer and first installed Finale 2.1, since that was pretty much the standard of the day. I’ve been with Finale ever since. I love the power and flexibility. Being a techie, complexity doesn’t bother me when I can craft the tool to my own particular use (which is probably why I’ve built my own Windows PCs for years). I appreciate that Finale tries to be simpler for different customers’ needs, but for me, the more customizability, the better! I just recently upgraded to Finale 26 and was very excited to see the improvements in articulation placement in particular. The way Finale now stacks articulations automatically – and even extends stems to make room for tremolo markings – is outstanding. One feature I would like to see implemented is more awareness of lyrics not butting up against the notes, stems, and beams above them. It just seems like that could be automated in some way. Another thing on my wish list would be enhancing Finalescript to be able to record your keystrokes and mouse input, like a true third-party automation might. More people would probably use this feature if you didn’t have to understand the scripting commands to do so! Have any Finale or engraving or arranging tips to share? Find ways to hone and improve your own particular workflow and process. That looks different for everyone, but generally it includes getting your template right, including lots of metatool assignments, and making use of plug-ins and macros. The idea is to get the power of a tool like Finale out of the way of your creativity. In the case of PraiseCharts, we have a very specific product for which we’ve crafted a powerful template. All the expressions, metatools, shapes, and the rest are in place and don’t have to be recreated with every chart. Tools like TGTools Pro and Finalescript are quite good as well. TGTools Pro can assign hotkeys to any menu item you choose. I used Quickeys for years until they stopped supporting the Windows version, then I had to adjust my toolkit a bit – fortunately, that was about the time Finalescript came into being. A lot of what we do is brass section writing. In my case, I tend to write unisons or stacks first in the top trumpet staff, then use Explode Music to distribute as needed to the rest of the staves. This works great for big band as well. A very basic Finale technique, but super-useful. Also, I do write everything in concert pitch, saving transposition until part editing and print out. One particular technique that I think a lot of Windows users overlook (and I can’t speak for Mac), is the ability to call menu functions, and even make certain selections within dialog boxes by a simple sequence of keystrokes. For example, to replace one font with another, you could point and click your way through the menu, or just hit Alt (then release), O, C, U, and S – all without touching your mouse. Others would be Alt, O, I to toggle concert pitch, or Alt, O, M to for the Manage Parts dialog. Memorizing several of these sequences, or assigning those to hotkeys using TGTools Pro are all good ways to speed up your process. Have a favorite David Shipps story? Well, it’s one of those “I knew him back before…” things. When I was based in Oklahoma City back in the early 2000s, he looked me up and asked for work. PraiseCharts was nothing more than a fledgling upstart back then, so he did a few things for us before moving to the greener pastures of Nashville (pun intended). I think that situation would more likely be reversed at this point! I love that we are able to bypass the traditional print industry and supply high-quality charts for churches all around the world – even the day after the song’s release – with absolutely no conventional print house overhead. It’s a win-win for everyone. PraiseCharts is a classic tech-based company – we can use today’s technology to provide a product that in previous years was only available from choral suppliers or music stores. We can instantly poll customers, release new songs on a moment’s notice, and do it all in a completely decentralized way, utilizing a network of contributors all over North America, even including Australia. We actually do have a home office now in, but that came 15 years after we got started! How did your relationship with PraiseCharts.com begin? Around 2001, mainly at the prompting of my friend Mark Taylor, music pastor at Metrochurch, I started considering how I could leverage the Internet to market my talents in arranging for the local church. I discovered Ryan Dahl and his upstart website “PraiseCharts” and asked how he did what he did. We ended up just joining forces and running with what he had started. Things developed over the next few years, and after traversing many industry hurdles along the way and experiencing some growing pains, I’m pleased to see that PraiseCharts is one of the most popular resources for church music leaders around the world. Can you describe what is your workday (or workflow) is like? Each day is different, but lately it’s been a mixture of editing, consulting, managing a few different projects, and handling most of the orchestration queue. We homeschool as well, so I can take a break to hop up and assist with the different needs of the kids to get my eyes off the screen for a bit. How did the Worship Band Series come about? We don’t really call it that anymore, but it does serve to define our main orchestration product. Its genesis was in my desire to create a product that served the needs of many different levels of church instrumental programs in the area of congregational worship for new praise songs. There were already plenty of choral anthem/orchestration products in the marketplace, as well as orchestra features, all of which were more complex than I wanted. There was even a popular product from a well-known publisher for orchestra accompaniment of new praise songs, but they tended to be rearranged and watered down from the original recording. I wanted to help the music pastor recreate the vibe of the original recording that excited him in the first place. 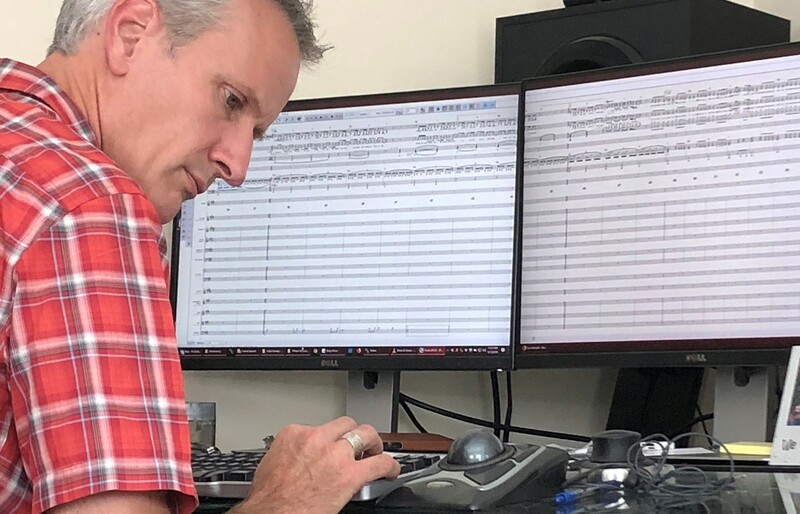 So we started basically transcribing the arrangement from the original recording, then filling in some BGVs and orchestration behind it as appropriately as we could, while balancing the participation needs of the church instrumentalist. That was really unique in the industry at the time, but we stuck to the formula and it caught on. It’s meant to be used for groups consisting of anything from a lone worship leader, to a rhythm and brass (or strings) praise band, to a medium-sized orchestra. What fonts have become integral to your look?? From the time handwritten fonts came out, I was sold. With the contemporary music we were wanting to release, the stark, traditional look of Petrucci didn’t seem to catch the vibe of what we were doing. So I created our template out of a combination of fonts to achieve what to my eye looked friendly, clean, and fresh. It basically combined elements of Arial and Jazzfont, along with some thicker lines to give it a more handwritten feel. Not a completely handwritten look, but more relaxed to my eye than traditional press. We didn’t use handwritten fonts for text, though, as it seemed to be harder to read at a glance. I wanted a balance between traditional and contemporary, so I chose the sans-serif Arial instead. We’re actually in the process of creating a new product that includes our most popular songs in melody-only lead sheet format, but in all 12 keys, as well as the rhythm charts and bass transcriptions from the original recording. But there is always the ongoing stream of new orchestrations to write, as I happen to be working on today. Have any advice for young musicians who’d like to follow in your footsteps? Be tenacious in your pursuit of what you want to do. Knock on the doors, make the calls, improve your skill set, but be patient with God’s plan for your career! Thanks again to Dan for sharing a glimpse of his background and work with us.